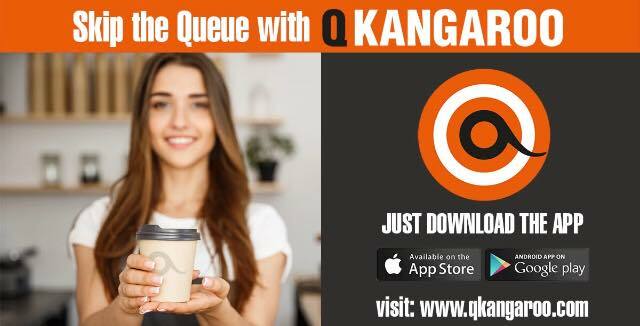 The idea for a successful new app called Q Kangaroo, which allows users to pre-order and beat the queues at their favourite coffee shops and restaurants, came to Crossmaglen-man Ross Kernan out of necessity as he was sitting at an airport. And so twelve months ago, Ross and a team of tech experts in Dundalk and India, began developing the idea for the Q Kangaroo app. The ingenious app allows customers to save time by ordering and prepaying for a coffee or food order and skipping the queue once they get to the establishment. The app also tracks pending orders and notifies you once your order is ready. The start-up team, who are based in Block D of the Tain Court building, started testing out the app in three popular local cafes: Riva on Earl Street, Panama at Dundalk town square and Cafe Aqua in Dundalk, three months ago. The app, has also come full circle back to Ross’ original idea and is now going through beta testing with 20,000 staff at Dublin airport. The Crossmaglen man says the feedback so far has been “fantastic”. Ross, who started teaching himself about digital marketing and software development after a knee injury left him out of action from his former job as a joiner, also has his eye on the prize for the future. Kernan is keen to get the app operational in many more transportation hubs around Ireland. His company also have a few other functional apps focusing on the transport sector in the pipeline.